With daily usage of your garage door, it is bound to undergo wear and tear. 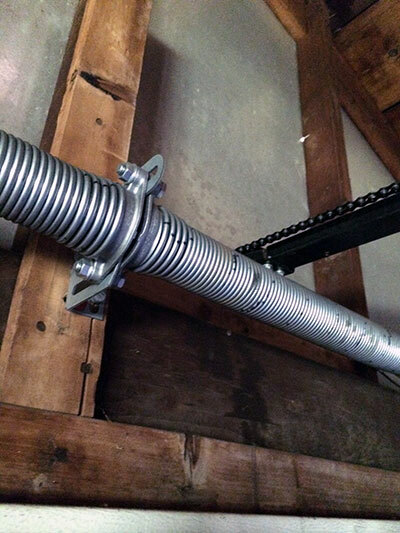 This is most applicable to the torsion spring, which bears the entire weight of the entire garage door and helps to move it upwards against gravity. These color coded springs are responsible for opening and closing of garage doors and is under constant tension. When the coil of the spring appears distended or irregular then it is a sign indicating that the spring should be replaced. A bad spring is more visible when the garage door is closed. However, the pulley and I-bolt help to keep the spring in place. Attached to the I-bolt is a vertical bracket. There is also a safety cable that runs through the spring to serve as a safety measure for when the spring breaks or snaps. Garage door extension springs can be replaced and this should be done before they give way. Our technician will have your new replacement extension springs ready to install. The safety cable will be removed to free the extension springs. It is ideal to change both springs even if just one is faulty because springs of unequal tension will prevent the garage from closing properly. The pulley will also be removed with wrenches to release the cables running through the spring. Once the spring is loose a replacement will be put in place. The safety cable will then be threaded back into the new spring and tightened with Lineman’s pliers. Care will be taken to ensure that the pulley cables do not get tangled with the safety cables.